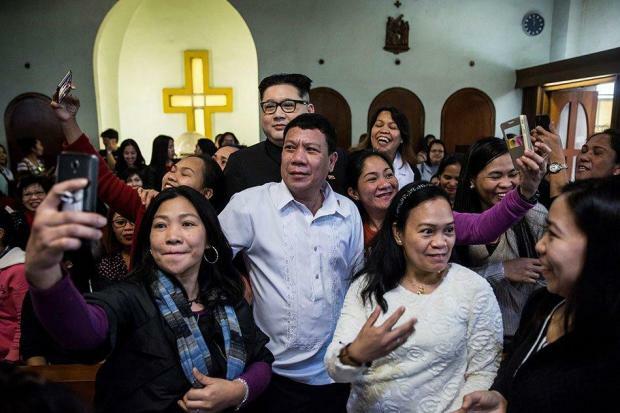 An impersonator of Philippine President Rodrigo Duterte (centre front) poses for photos in a Hong Kong church. A Rodrigo Duterte impersonator sparked frenzy and confusion during Sunday mass when he walked into a Hong Kong church popular with the city's Filipino community. Accompanied by Howard X -- the Hong Kong-based impersonator of North Korean leader Kim Jong Un -- the Filipino actor arrived at St. Joseph's Church dressed in the Philippine president's signature relaxed white shirt. "Is that Duterte?" whispered an incredulous-looking woman, who said the man appeared too young to be the Philippine leader. While most did not mind the stunt, one woman who identified herself as Linda found it "impolite". "Coming in here to make a scene -- our Duterte is not like that," she told AFP. And the Church has been one of Duterte's most outspoken critics, particularly over alleged human rights abuses during his deadly anti-narcotics campaign.